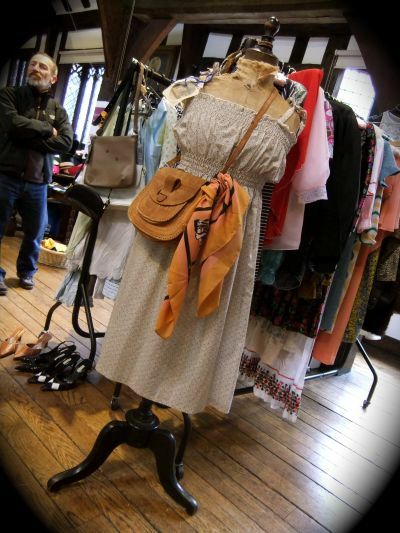 York does Vintage meets Souk Fashion and Lifestyle Bazaar ran from May Saturday, May 14 to May 15. Suited and booted, I attend this fair with an excitement to see the best that York could offer, and I was not disappointed. From the fashion to the jewellery and the cake, via the entertainment, the whole event was totally fabulous. It left me inspired to explore; I implore you, reader to just take a look around you and see what people can create at these vintage events if you gwt chance to go. I don’t mean the stuff that’s pumped out of factories by multitudinous miserable factory workers, of course. There were so many beautiful things on offer that actual people had put their own time and effort into. I wish I could tell you about every single item in the fair. But, unfortunately, I do not have enough words! Set in the ancient climes of St William’s College, each room was a little discovery in itself. Each fourteenth century room held a treasure trove of vintage, cutting edge, recycled items and everything in between. Each piece individually created and loved in its own way, just begging to be admired and adored by a worthy owner. My highlights of the fair were many but I’ll stick to the highlights of these err…highlights. Isabel Wong is an up-and-coming luxury womens-wear designer (isabelwong.com) whose clothes are utterly beautiful. Simple, experimental and yet wearable; muted in colour but vibrant in design. Modern and distinctive, Isabel’s clothes really stood out to me because of their simplicity, individuality and unlike many young fashion designers her clothes will actually be worn. Another stall that stood out for me was that of Twopenny Lane (twopennylane.com) and alter-ego Two Bad Bananas (twobadbananas.com). They featured inspired little pieces made from doll’s house miniatures that were so much fun. I am willing to wager that if you do not crack a smile when you see them, you are some sort of a psychopath (albeit a lovely one that really enjoys reading soundspheremag.com, right Darcie? – ed). My favourites included a goldfish bowl ring, a spinning globe necklace, a working harmonica necklace and a smiling mushroom pendant. Quirky and cute, I just wanted to buy everything! If you’re looking for something fun and unique then you should definitely have a look. Unquestionably conversation-starting pieces. I love the idea of ethical fair-trade and recycled items, which is why I really like Onfriday (onfriday.co.uk). Their green policies are admirable. They are a company trying to “make a difference”…no, really! They’re doing a good job! They are interested in all things ethical and fair, and would like to help people as well as the planet. The bags are made from materials such as firehoses, seatbelts, and the inner tubes of bicycles. If you enjoy something individual, interesting and above all work that comes from a place that did not harm or damage the planet, then this is a company that you must check out. After much deliberation over which cake I should eat at this event, I finally tucked into a yummy Bakewell Tart-style cupcake from Curiositea Shop (curiositeashop.blogspot.com), and listened to the lovely voice of Cara Jemison (carajemison.co.uk) who provided some light musical entertainment to the patrons of the teashop. I then spotted the amazing designs of Violet Wilde (violetwilde.co.uk). In particular, the exquisite corsets caught my eye. Black satin and boned, with peacock-feather half-cups and feather-trimmed base, I could not stop looking at this particular design. Eventually though, I put it down (a bit out of my price range) and lusted after it for the rest of the event. Violet Wilde’s website provides you with the possibility of designing your own individual and bespoke corset – just tell them your measurements and they will make your very own, inimitable corset. Perfect for those aspiring burlesque performers and vintage pin-up girls. Finally, Sophie Likes (sophielikes.com) stood out immediately because of the stall they used. It was like something you might see if you were at a sunny farmer’s market in the middle of a field, standing in your wellies and looking at yummy homemade jam. It was cute, fun and different and drew my eye straight away. The products matched the image that I got from the quirky sun shelter. The delightful products range from clothes to books to accessories and cards. Hoping to capture the essence of London based markets such as Portobello Road or Camden, Sophie Likes provides the market experience for the North! Apparently most people wear 20 per cent of their wardrobe 80 per cent of the time. The Clothes Swap (http://www.facebook.com/ClothesSwap) aims to help you get rid of these superfluous items of clothing in exchange for something new. Clothes should be worn, so don’t leave them sad and unworn! Along with the use of just a pound, you can swap them for tokens that can be used at various events in York, such as the Jamboree. 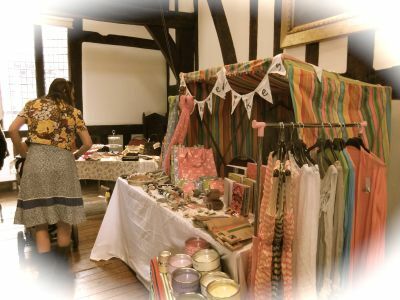 A day guaranteed to inspire, York Does Vintage meets Souk Fashion and Lifestyle Bazaar delivers a lovely day out, with gorgeous stalls full of beautiful things. The next event from these organisers is the aforementioned Jamboree at Kennedy’s Bar in York on June 12. I’ve already started saving, have you?